You is Just a Phone Call Away! 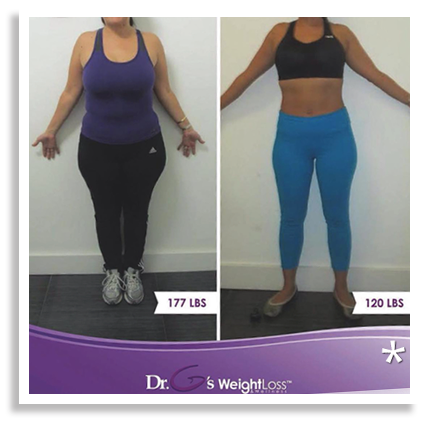 What is Dr. G’s Weight Loss? Have you tried Jenny Craig, Nutrisystem, or Weight Watcher’s and been unsuccessful in the past? If so, it is time to cleanse yourself and get the medically assisted weight loss program from Dr. G’s Weight Loss and Wellness™. Our program is a comprehensive, medical weight loss and wellness program that helps individuals battle their weight loss struggle and give them the opportunity to finally reach their goal weight. Our philosophy is that obesity is a disease and should be treated by a physician using medications, lifestyle, and diet changes. Once you have achieved your optimal weight, we find that additional body sculpting may help present a new you… CoolSculpting® can help contour certain body areas. Our philosophy is that, “Not one size fits all.” We have developed systems to individualize each patient’s treatment plan. Whether you want to lose 10 pounds or 100 pounds; have a slow metabolism, thyroid issue or you cannot control your portion sizes, we have a personalized medical program that will work for you. Based on your age, weight, blood work results, medical history, body mass index and weight loss goals; a physician will prescribe a combination of medications, along with our proprietary herbal supplements, that will reduce your appetite, cravings for carbohydrates and sugar, anxiety eating, increase your metabolism and make you feel fuller, faster. No boxes meals! You can enjoy regular meals with your family both at home and at restaurants. If you prefer a simple meal replacement or snack, we have proprietary products that taste delicious, and that are scientifically designed to work with our weight loss medications. A proprietary wellness portal is included in all programs, it includes mean ideas, food tracking, affirmation to keep you going and more! There are several ways to incorporate exercise into your everyday life. Whether you like to walk, use the Wii Fit®, run marathons, or take classes at the local gym we will help you incorporate the appropriate exercise routine into your lifestyle. If you burn more calories than you consume, you lose weight. It is that simple. Physician Directed Tailored to you!